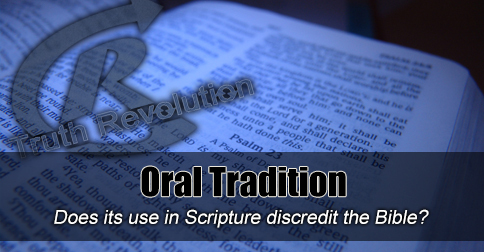 Does the use of Oral Tradition in scripture discredit the Bible? [audio:http://www.truthrevolution.tv/show/TS-0304.mp3]No Flash Support? Use this Audio Player! Dave: Are some Biblical stories based in truth, but exaggerated over time before being written down? Jeff: Was there oral tradition? Yeah. Dave: Does that mean the Bible is not accurate? No. Jeff: The concept of their being an oral tradition that turned into a written record is known as “Source Criticism” or “Form Criticism” – in themselves it’s kind of a cool thing. Trying to figure out how these writings came to be. Dave: But, the danger is that we judge something based on our best guesses rather than its own merit. Dave: But because the world is round, this is impossible no matter how high the place is. What’s going on? Jeff: Just reading it on its own merits, we know The genre or language is periphrasis (adding superfluous words to extend the message) or hyperbole to make the point that the Devil was offering something quite attractive. Dave: So, was that an oral tradition? Maybe. What’s the history and/or point in itself? Is that true?